Big Brother 16 Spoilers: Week 2 POV – Power Of Veto Competition Results – Will [Spoiler] Save Paola Or Brittany? The drama is really heating up on Season 16 of Big Brother. This week Devin won HOH along with Amber, and he became so conceited and power-hungry that he decided to curse out half of his alliance, the Bomb Squad, and go rogue. During the nominations he opted to put Brittany and Paola up for eviction and then informed everyone in the house that they had to vote Brittany out because, basically, he didn’t like her. Unfortunately, Brittany and Paola lost the Battle of the Block competition, so Amber’s nominations were removed from the block and she was dethroned, giving crazy Devin even more power. The entire house, including Devin’s ex-alliance members, seemed determined to save Brittany from eviction. The Power of Veto competition rolled around and the worst possible scenario happened: HOH Devin won the Power of Veto. Now, BB16 fans are waiting on the edge of their seats for the POV ceremony — because with Devin running the show, anything can happen. Before the Power of Veto competition, Devin promised Paola that if he won he would remove her from the block and put Victoria up for eviction. It will be interesting to see if Devin keeps his promise; it’s not too often that HOH’s veto their own nominations. Devin is a loose cannon though, and it is impossible to predict what move he will make next. 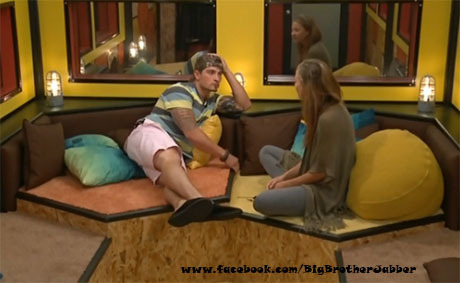 He recently had a falling out with his ex-alliance member Caleb; Devin could shock everyone and backdoor his ex-friend. Are you as annoyed as we are that Devin won the Power of Veto competition? Do you think he will leave his nominations the same or stay true to Paola and remove her from the block and nominate Victoria? Let us know what you think in the comments below and don’t forget to check CDL for all of your Big Brother 16 spoilers. Big Brother 16 Spoilers: Devin Leaves Bomb Squad And Goes Rogue – Will He Try To Backdoor Caleb If Brittany Or Paola Win Power Of Veto?